All Jeep models are built around leading capability, and the new Jeep Cherokee draws its richly responsive drive from one of three engines. 2.4L Tigershark® MultiAir®: Makes up to 180 hp and 171 lb-ft of torque. 3.2L Pentastar® V6: Makes up to 271 hp and 239 lb-ft of torque. All-New 2.0L Turbo: Makes up to 270 hp and 295 lb-ft of torque. A sophisticated nine-speed automatic transmission is paired with all engines as standard, so expect pitch-perfect power delivery whether creeping out of a parking space or overtaking on the highway. Boasting up to 24.6 cubic feet of cargo space behind the 2nd row or 54.9 cubic feet behind the 1st row, the new Jeep Cherokee has space enough for all you need to bring, and a maximum tow rating of up to 4,500 lbs. ensures you can bring along anything from boats to RVs behind you. Opting for the Jeep Cherokee Trailhawk brings tow hooks, skill plates, and Jeep’s legendary Trail Rated capability for traction, water fording, maneuverability, articulation, and ground clearance. Selec-Terrain® Traction Management System: Coordinates 12 vehicle systems around five drive modes: Auto, Sport, Snow, Sand/Mud, and available Rock. Three 4×4 Systems: Choose between Jeep® Active Drive I 4×4, Jeep® Active Drive II 4×4, and Jeep® Active Drive Lock 4×4. With dependable Jeep Cherokee utility on their side, drivers can cover every path of life without breaking stride. If you’d like to find out more, compare against the larger Jeep Grand Cherokee, or arrange a test drive, don’t hesitate to contact us today. 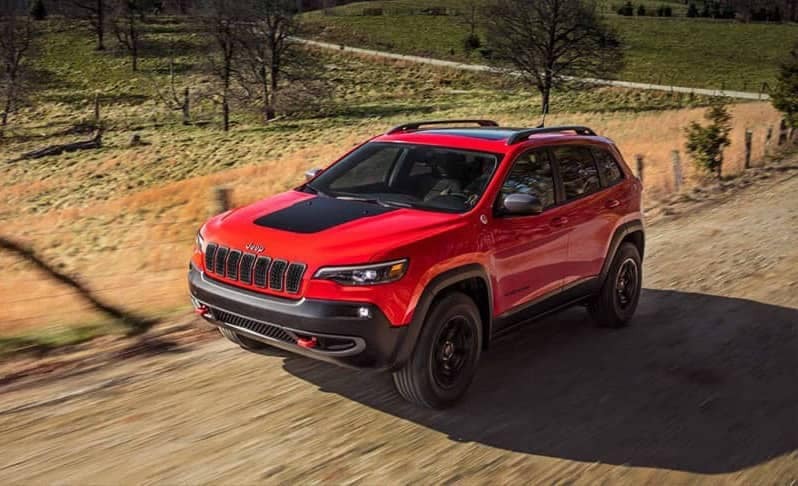 View Inventory Learn More The 2019 Jeep Cherokee has all performance specs and utility features you want, whether you’re driving around Green Bay or going off-roading with some friends on some Wisconsin scenic drives. From powerful engine options to capable towing specs, this SUV is more than ready to tackle any adventure that comes its way….